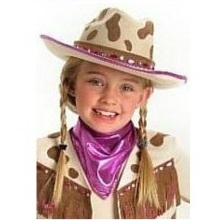 Complete your cowgirl costume with this fabulous Rhinestone Cow print Hat. The Child’s Deluxe Rhinestone Cowgirl Hat features a brown cow print cowgirl hat with faux gems on the hat band and a pink trim. Wear your finest cowboy vest, skirt, and this stylish hat and you’ll be getting all the cowboys to take a look at you!